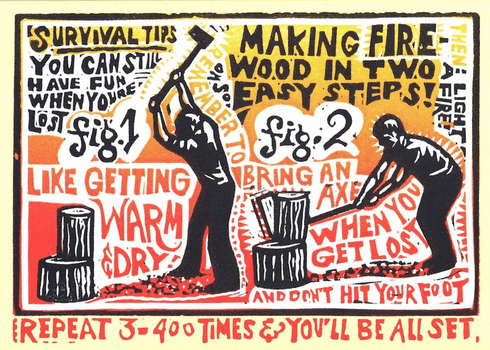 Outside: Survival Tips: You can still have fun when you're lost. Making fire wood in 2 easy steps. Fig. 1 and Fig. 2. like getting warm and dry. Also, Remember to bring an Axe when you get lost, and don't hit your foot. Repeat 3-400 times and you'll be all ser. then light a fire! Artist: Rick Allen. Measures 5 x 7 Inches.